Optoma EH502 was designed to deliver unsurpassed performance and reliability to meet your installation needs. Its powerful 5,000 lumens output and impressive 10,000:1 contrast ratio deliver remarkably bright presentations with sharp text and color-rich graphics. To ensure it will perform to your needs, EH502 features a comprehensive I/O panel and advanced features. HDMI for digital connectivity, over-the-network presentation capability, wireless presentation capability via optional USB dongle, vertical lens shift and discrete audio inputs including microphone input for maximum installation convenience. 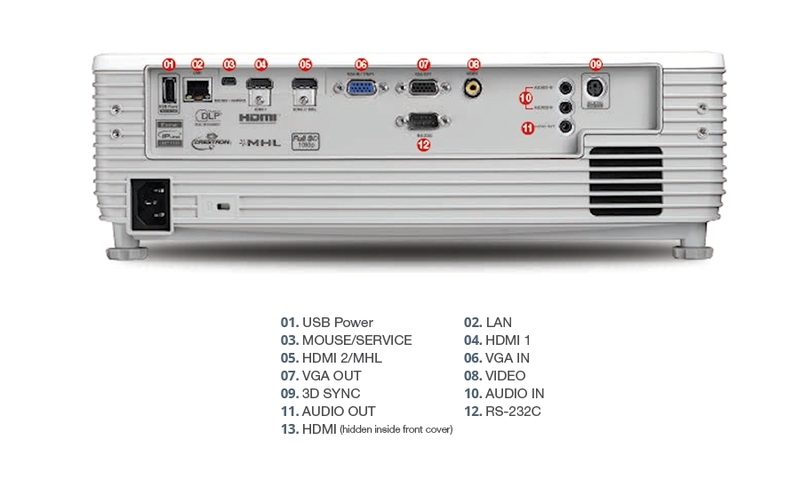 EH502 supports HDMI 1.4a 3D playback, including 3D 1080P Blu-ray, 3D gaming consoles like PS4, XBOX360 native 3D games, and 3D broadcasting signal, just connect Full HD 3D player directly to EH-502 via HDMI, you can instantly become part of a fantastically immersive experience . The 3D effect isgenerated by splitting this signal into two standard video streams, one for each eye. Using DLP® Link™ technology, the 3D glasses synchronise with the image on screen to filter each stream to the correct eye. Your brain then combines the two streams to make them jump into life. EH-502 can be monitored over LAN and provide the user email message alert in case an error occurs or a lamp fails or needs to be replaced using Crestron Roomview. The web browser interface and full support for Telnet, Extron’s IP Link, AMX Dynamic device discovery and PJ-Link protocols, allow almost all aspects of the EH502 to be controlled across a network, keeping you in control, wherever you are. Vertical lens shift gives you the ability to move the projected image up or down, while keeping the projector stationary. This makes it easier to position the projector in your room and enables a wider range of screen size options. Turn EH-502 into a smart display by connecting your smartphone or tablet with a single cable using MHL, enabling you to view presentations and documents, stream videos and share photos on the big screen. Individually warp each corner of the image to create a perfectly square image. This funciton is ideal for image stacking, uneven walls or where projector placement is awkward and needs to be installed at an angle. USB power can be used to power a HDMI dongle, such as Google Chromecast or the Optoma WHD200 wireless HDMI device. Lamps can blow, if you need your projector working and can't afford down time, you may need to keep a spare lamp. The replacement projector lamp for the Optoma EH502 is the .